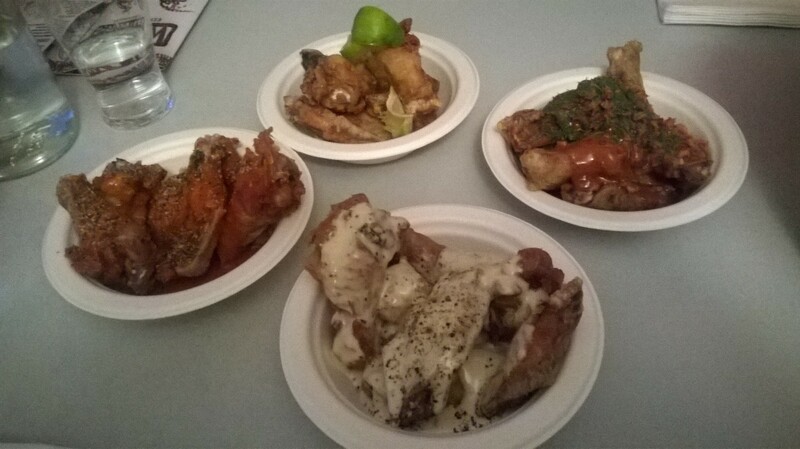 But after visiting Wings with an equally skeptical fellow gastronaut, I have to say I’m now a wings (and Wings) enthusiast. The straight-forward concept is well executed and the unpretentious experience really got me hooked. 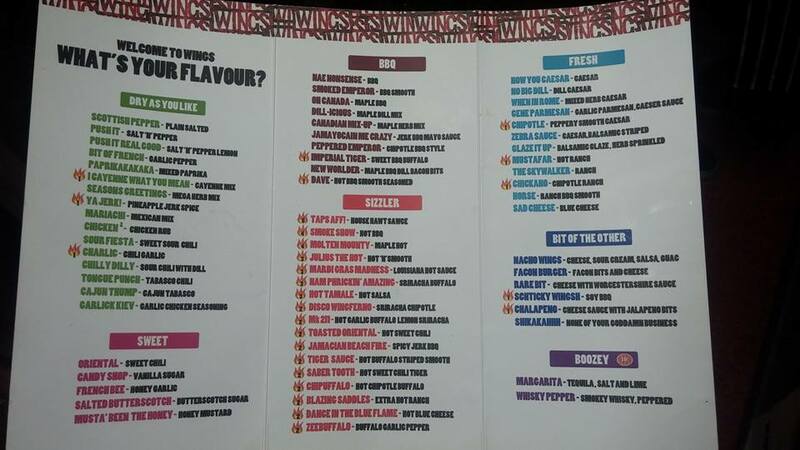 We grabbed a table and started choosing sauces for our wings from an extensive list based on different flavour styles – hot, fresh, dry rub, BBQ etc. There’s also the option of some sides or a beer to go with your meal. Once ordered the wings were quickly delivered, six to a bowl. Each bowl is £3.50. We also got a lot of napkins, drinking water and a metal bucket for chomped on wing remnants. Dip, chew, toss, wipe, repeat. Win(g). The Margarita was probably the least interesting, with a slight tequila aftertaste but otherwise not much more flavour than the squeeze of lime we added. Our favourite was easily the New World. The crispy bacon bits were a marvellous addition to the BBQ sauce and the dill provided a fresh zing. We fought over the last wing – it wasn’t pretty. It seemed a shame not to try a side, so we ordered some tortilla strips too. They were thin and crispy, deep fried and delicious in their unhealthiness. We opted for a blue cheese sauce with them – there was plenty of it, but it lacked a really strong blue cheese flavour. Now, anywhere that serves a bucket with its mains can hardly be described as upmarket, and the decor is in keeping with that vibe. 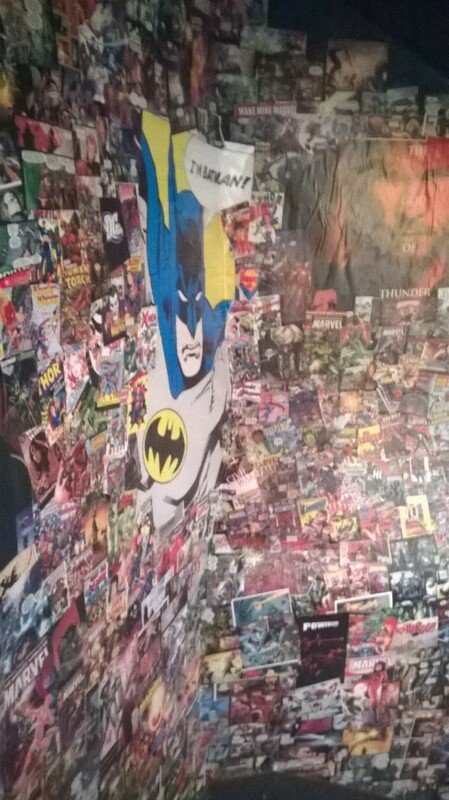 Evoking a geeky student bedroom, there are X-Men comics for wallpaper, Doctor Who posters, shelves of Star Wars paraphernalia and small inflatable animals hanging from the ceiling. But somehow it works – and it certainly reflects the clientele. You can also play board games (presumably after you’ve washed your hands) and there’s a projector, so you can bring films to watch with friends. Wings is fun, casual and cosy. It’s not hipster – and these days in Edinburgh, that makes a welcome change. Best recycling of old magazines ever. The staff at Wings were so very friendly, helpful and good humoured that they deserve special mention. They really contributed to the relaxed home-from-home vibe. The service was swift and attentive, which is a wonderful thing when your hands are covered in grease and you really need more napkins. Since there’s no cutlery, eating at Wings is a very messy experience. Tearing tender flesh from a bone is not going to be everyone’s cup of tea. But if like us you don’t mind, then get stuck in and enjoy the carnal eating. We smacked our lips with joy and enthusiastically licked our fingers clean. Which leaves one final thought: first-date food this is not. You’re welcome. Last updated by AmyB at January 29, 2015 . Is peri peri chicken by another name as tasty? Yes, it is!